Winners were announced yesterday at the annual 2011 James Beard Foundation Awards, the nation's most prestigious recognition program honoring professionals in the food and beverage industries. 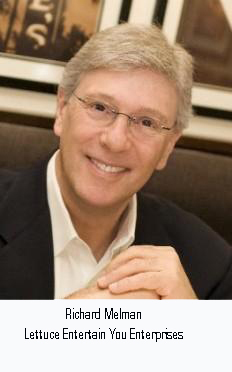 Richard Melman, founder and chairman of Chicago's Lettuce Entertain You Enterprises Inc., brought home the James Beard Foundation award for outstanding restaurateur in the nation. Melman, a well known Chicago-based restaurateur whose company owns more than 30 restaurants here and across the country, was the lone local restaurant-related winner out of 10 area nominees. 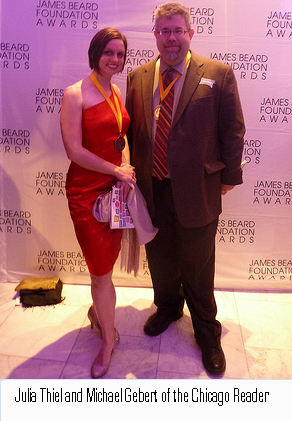 Michael Gebert and Julia Thiel of the Chicago Reader took home a James Beard Foundation Journalism award winning in the multimedia food feature category for their "Key Ingredient" blog. That category was announced Friday at a lavish dinner exclusive to working media. Chicago eateries and chefs shutout. Hopeful Stephanie Izard's Girl & The Goat, a finalist in the best new restaurant category, was beat out by Jean-Georges Vongerichten's ABC Kitchen in New York which focuses on local, organic and seasonal foods. Paul Kahan (Blackbird, Avec, & others), a 2004 James Beard winner for best chef in the Midwest, lost his bid for outstanding chef to Jose Andres of Minibar in Washington, D.C. 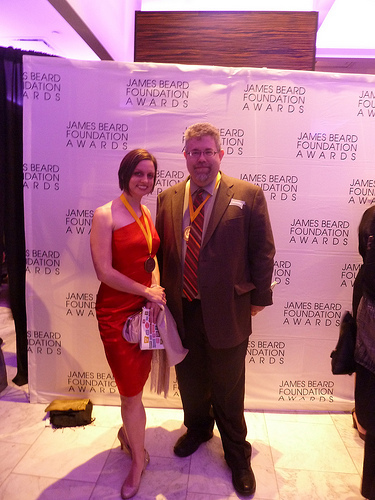 Colleague Patrick Fahy, also of Blackbird, and Mindy Segal of Mindy's HotChocolate, who was also nominated in the same category in 2007, lost the outstanding pastry chef award to Angela Pinkerton of New York's Eleven Madison Park. Multi award winner Rick Bayless' Topolobampo lost the outstanding service award to Thomas Keller's Per Se in New York. Bayless won a James Beard award for best chef in the Midwest in 1991 and chef of the year in 1995. He was also named humanitarian of the year in 1998 by the James Beard Foundation. Four of the five nominees for best chef in the Great Lakes region were from the Chicago area, Michael Carlson of Schwa, Curtis Duffy of Avenues at the Peninsula Hotel, Bruce Sherman of North Pond and Paul Virant of Vie. The award went to Alex Young of Zingerman's Roadhouse in Ann Arbor, Mich.
M.F.K. Fisher Distinguished Writing Award: Jonathan Gold, LA Weekly, "A Movable Beast"
Craig Claiborne Distinguished Restaurant Review: Patric Kuh, Los Angeles, "Animal Magnetism," "Making Their Move," "Time for a Redo?" 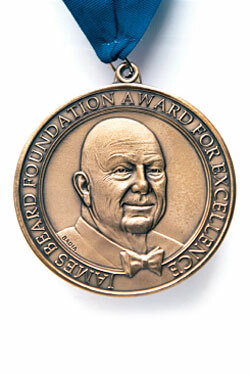 Visit http://www.jamesbeard.org for more information.